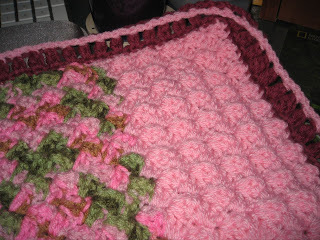 My friend Sandie over at Crochet Cabana blogged about a little 6 year old girl named Lyra with cancer. 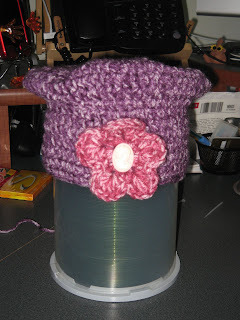 She mentioned making some hats for her and that her favorite colors were pink and purple. 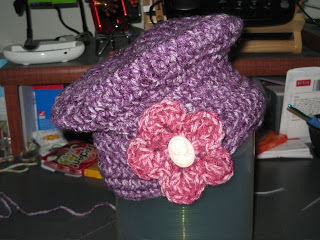 Sandie mentioned that she was going to make her some pink hats but had no purple yarn in her stash so I decided that I would make a purple hat for her from the leftover Vanna's Choice, purple mist yarn I had from my last finished project, (the shawl). Here are a few pictures of it. I made it up as I went along and I think she will like it. Sandie, I will put it in tomorrows mail. Thank you again for the opportunity. 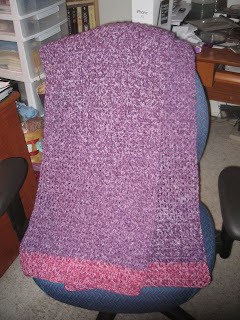 I have finished the shawl that I started awhile back and ran out of yarn. The yarn finally arrived so I finished it last night. It feels so good to complete projects that have been sitting awhile for one reason or another. Not sure who it will go to yet, I might keep it for myself. *grin* Anyway I just wanted to share this with you and will be back later in the day to let you know my plans for my next project. *hugs* and have a wonderful day! It have been a very busy last few weeks. First we had hosted two big milestone celebrations, one with over 25 folks and the other over 50. I made all the food for the first one but the second one was catered but I was hostess. A great time was had by all. Well after that our Dentist had asked us out to dinner that following week so we went and had a great time. That very next weekend we had them over to our home for dinner. Then after that 2 more dinner parties for 8 to 10 people. Now that all that is finished I now had the District Convention of Jehovah's Witness and that was in the city and it is for three whole days which was Fri, Sat and Sunday of this past week. I so enjoyed this convention. So Monday I was out all day running errands that I did not get a chance to blog until now. Then Tuesday, Wednesday. and Thursday of this week I have been at a training class for one of our partner/ clients. It has been a geek week. Oh, did I mention that Nicks brother and sister-in-law and two boys Evan and Andrew arrived yesterday. Evan is moving on campus this weekend to start College. He will be going to Berkeley. So we will be having them over for a BBQ on Sat. and we went out for dinner last night. Now that I have bored you to death I have to say that I have not had time to crochet. I will close for now, but if I remember more I will come and add it. 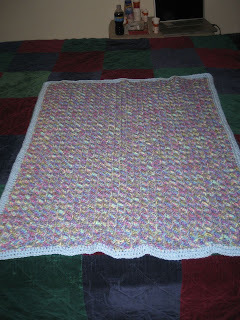 Here is yet another baby blanket that I finished up last night. This one is for a girl and I loved making it. The edging is my own pattern. I first did a sc all the way around the blanket and then followed that with 2 dc, ch 1, skip the next stitch then 2 dc in next stitch. 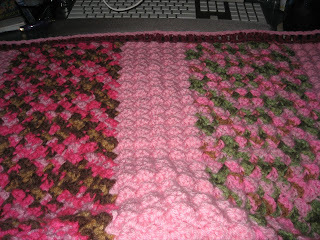 I did that all the way around then changed back to the light pink color and did a chain 1 then did FPsc's around both of the 2 dc then chain one then repeated that all the way around the blanket. It gave it a very nice rope look. The pictures don't do it justice. 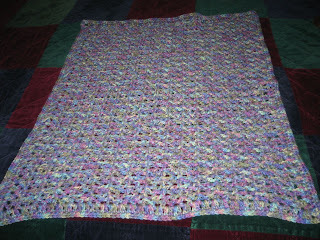 I seem to be in a baby blanket mood so I am sure that I will be starting another one today. Have a great day and sending *HUGS* your way!! Just finished 2 baby blankets in Coats and Clark Super Saver, color is Monet. I just love the colors in this yarn. I trimmed one of them in a baby blue which I think really brings out the other colors in the yarn. One is done in a "V" stitch which is more open and lacy and the other is done in a 'Tiny Texture' stitch which is more solid and heavy but textured. II also received a wonderful package from my sister Ghost. She made me a beautiful set of coasters and a "Going Green Market Bag". They are to die for and if you'd like to see them you can visit her blog and take a lookie see. 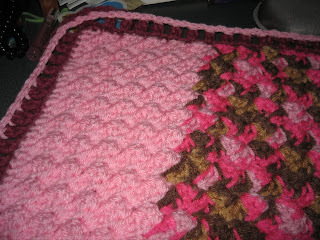 I am working on another blanket tonight and I am going to try and make a doily. We'll see. *hugs* to all of you and have a great rest of the week. 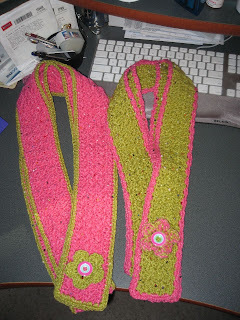 Since I had fun making the scarves I decided to make a wide headband. I made the pattern up as I went along and am quite pleased with it. I will be making more of these. 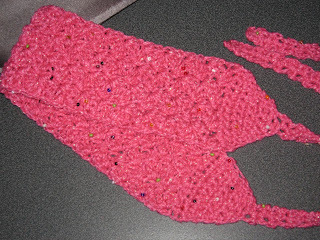 The Beadnik yarn is perfect for this type of project. I think that even women with short hair could wear this headband. The Groove Green trim one is just a single crochet all around but the Bongo Pink trim is sort of a shell with 3 sc in every other stitch. I had fun making these and I really enjoyed working with the yarn. 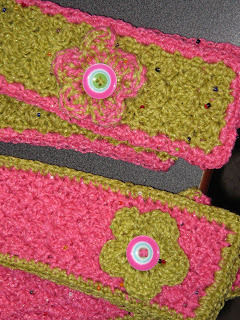 I am thinking of making some headbands now for my niece and sister. My friend Catherine is visiting us from San Luis Obispo and she and I try to see a movie every time she visits. Yesterday we decided to see"Mama Mia". Well let me tell you, it was FABULOUS!! It had it all, music, drama, laughs, dancing and of course singing. LOTS of SINGING!! All ABBA songs which I knew all the words too. LOL!! I just loved it and so did my friend. The actors did a great job singing and dancing their parts. If you want to see a feel *REAL* good movie, then this one is for you. I give it 5 stars out of 5. I would have never blogged about it unless I really liked it. *hugs* to all my readers.